Chile is the world’s third most attractive country for copper mining investments behind Canada and Australia, according to a report from the Chilean Copper Committee, Cochilco, which includes 15 leading countries in the industry. The document (in Spanish), released Monday by Mining Minister Hernán de Solminihac in Santiago, takes into account structural aspects of the different economies from the World Economic Forum and the Heritage Foundation records, as well as information on investing conditions in the mining sector in countries provided by the Fraser Institute. "The work included the fifteen countries with the largest copper mining developments in the next decade with a total of 120 projects which imply investments in the range of $240 billion," Solminihac said. 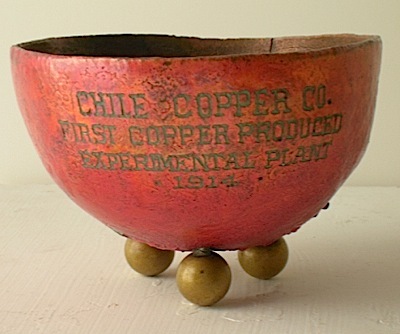 Chile, which is also the world's largest copper producer, accounts for roughly 1/3 of global copper output. Although this position is not under threat, faces the challenge of transforming its copper mining industry into social capital for the long term, and addressing high energy costs, which have grown seven-fold over the last decade. Rodrigo Balbontín, an analyst at the Centro de Estudios del Cobre y la Minería (CESCO – Centre for Copper and Mining Studies), explains that water shortage in Chile's northern desert, where the principal copper mines are located, has forced companies to get their water supply from the ocean, which must be desalinated and transported to 800 metres above sea level. "Pumping water up into the Andes requires a great deal of infrastructure as well as energy resources," he told Inter Press Service. Balbontín forecast an increase in copper production and consumption worldwide over the next decade, and stable prices that will not drop below the level of two dollars a pound, as they did in the mid-1990s.